Your Family, Agile, and You: The Feeling of ownership and quality time with our kids . The Feeling of ownership and quality time with our kids . How many times have you told your kids to stop strewing stuff all over the living room? And how many times have you wondered, when would you be able to stop repeating yourself? As you can imagine, it happened to me too. Now, for a pop quiz. How many of you have taken over these tasks for your kids? You might get angry with them from time to time, but YOU are the one tidying the room, getting their bags ready for the next day - you are the task owners. All of you? Yeah, I know the feeling. First, lets all agree that we want our kids to own their tasks. Second, lets agree that we want to stop nagging them. Third, lets agree that the kids want to stop being nagged too. Now that we’ve agreed on all that, lets continue. After all, i believe, we all want quality time with our kids, meaning we all need to free our valuable time with our kids to more important stuff than the same old nagging over and over again. So how do we do this with Agile? It’s simple, really. By the way, some teachers have already used this method in their classroom to get the kids to perform better and own their tasks. We take Kanban as a tool and Agile as a mindset and we manage to reduce the nagging and increase ownership. Doing that, we free up valuable time for a healthy family dialog. I believe that Feeling of ownership means that you are the one that care about this task. You do it because YOU think it is important and not because someone commanded you to do it. So how do we empower our kids, how do we help them become owners of the task? What benefits are we looking for? 1. How to get to the stage where the child does his task on his own (answers our needs as parents). 2. How to make sure it's not a one time thing. 3. How to make the child feel in control. 4. What values should we pass on, and what does the child gain by completing his tasks (involvement, parental communication, attention). A : Visualize the family chores. Introduce Scrum to your kids the fun way. Use colors, sticky notes and a board, and show them its fun. Fun helps us connect better to a concept. Once we are emotionally connected we will be more cooperative. 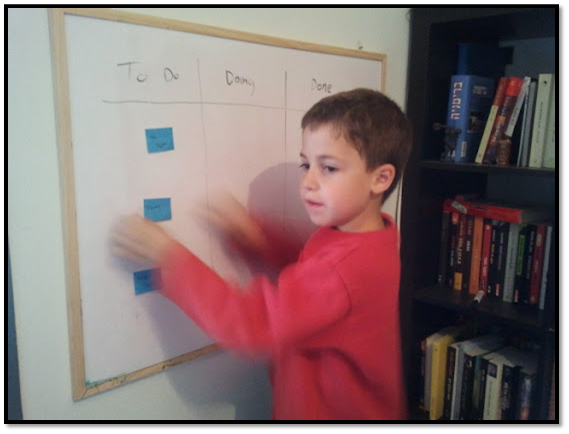 Build the task board together: Sit down with your kids to build a task board as a family. Let them be part of it. Don’t build it for them. When we do something ourselves, we relate to it better and we start to develop that sense of ownership toward it. Having the children build the board is also easier for us as parents. I mean, what can they possibly get wrong? And don’t forget, this way they have our undivided attention. So, just Draw the three columns, and let them do the rest. Everybody puts a task on the board - even Mummy and Daddy. Not too many, one or two each. Let them pick their tasks by themselves. ‘Helping’ them pick tasks just makes those tasks yours again. Suggested that it would be really fun to meet every evening and talk about the tasks, and move them on the board according to their progress. Meet every evening and talk about the tasks. Let the kids move the tasks around the board themselves. 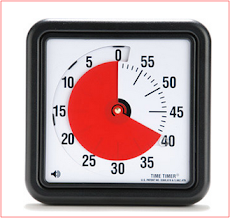 From time to time , suggest adding more tasks. Over time, your kids will take ownership over their tasks. They get to the board from time to time, and especially on times agreed they need to do their chores and move the tasks from one column on the board to another. It works in so many families these days, and its so simple. And … don’t forget to have fun.